Meet our Team of Undergraduate Recruiters, better known as TOUR Ambassadors! We're here to help you get to know Oregon State. From academics to student life, TOUR Ambassadors and Diversity TOUR Ambassadors share their knowledge and love for Beaver Nation through a student's perspective. Visit campus, meet the TOUR Ambassadors, and let us show you what Oregon State has to offer. Don't have a chance to visit campus? Or, want to get a sneak peek before you arrive? See what the 2018-2019 TOUR Ambassadors are up to! Interested in becoming a TOUR Ambassador? Fill out this interest form and see the bottom of the page for more information on applying for the 2020-2021 academic year. 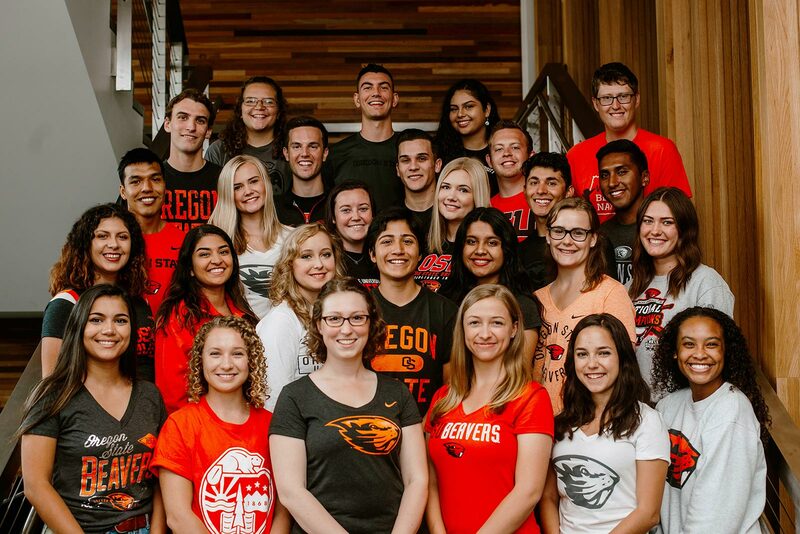 Are you a current Oregon State undergradute student and passionate about Beaver Nation? Apply to be a TOUR Ambassador or Diversity TOUR Ambassador! The Office of Admissions employs qualified, currently enrolled undergraduates as paid TOUR Ambassadors and Diversity TOUR Ambassadors. TOUR Ambassadors are often the first point of contact for prospective students and families. TOUR Ambassadors/Diversity TOUR Ambassadors conduct daily campus and housing tours, represent OSU during recruiting events & open houses, and have weekly hours working in the Welcome Center. Diversity TOUR Ambassadors have additional duties specific to multicultural recruitment, including attending application workshops, college fairs and calling prospective students. Successful candidates enjoy working with people, have a wide range of OSU experiences, and a willingness to share these experiences with prospective students and their families. Bilingual candidates are encouraged to apply. OSU TOUR Ambassadors are hired every winter and participate in a spring term training prior to official employment. Application for the 2019-2020 Academic Year is now cloed. Please check back in December 2019 for the 2020-2021 application. Intersted in learning more about being a TOUR Amabssador? Join our interest list here.